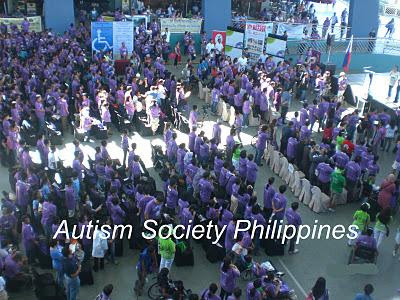 Autism Society Philippines celebrated the 2011 International Day of Persons with Disabilities with a Walk for the Right of Persons with Disabilities with the theme “Together for a Better World for All: Including Persons with Disabilities in Development” last December 2, 2011. The annual observance of the International Day of Persons with Disabilities aims to promote a better understanding of disability issues with a focus on the rights of persons with disabilities. (Source: UN Enable). “Make the Right Real” purple shirts and pins courtesy of UNESCAP, APCD and The Nippon Foundation were distributed for free to eager participants from various disability groups. The shirts ran out as there was an unexpected turn-out of more than 3000 people from LGUs, NGOs, advocates and supporters, including foreign delegates from the just concluded 2nd Asia-Pacific CBR Congress. All converged to “Make the Right Real Together for a Better Asia and the Pacific for All” at the Music Hall of SM Mall of Asia in Pasay City. This year, Hon. Jesse M. Robredo, Secretary of DILG, Chairs the International Day of Persons with Disabilities celebrations. He also gave the Keynote Address. Participants signed their names on the Pledge Board as a symbol to continue advocating for the best interest of Persons with Disabilities. The program was started with an invocation “The Prayer” led by the ASP Dream Girls (Thara Marie Santiago and Nica Escasinas) with the PAVIC Twins, followed by the National Anthem. 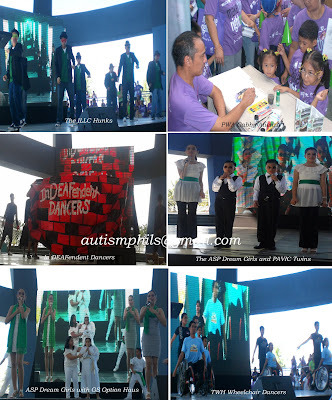 After an energetic warm-up exercises courtesy of Ms. Joanna Hizon and Company from DSWD, a video presentation of “Make the Right Real” was shown in SM Supermalls’ giant LED screen. Emcees ASP Chair Emeritus, Dang Koe, and WOW-LEAP President Ms. Carmen Zubiaga led the audience chant “Make the Right Real” before Dr. Maureen Ava Mata, Chairperson of Makati Federation of PWDs Declared the Walk. Participants waved their complimentary green flaglettes, as they were escorted by the Mandaluyong City Drum and Lyre Group around the mall. Ms. Grace Adviento, (ASP National-President) led her contingents from ASP Cavite Chapters, ASP UP CAMP Manila, ASP Muñoz Chapter, ASP Project 4 Chapter, ASP Mandaluyong Chapter, ASP Commonwealth Chapter, ASP Malolos Bulacan Chapter and other ASP member schools. After the walk, she also gave “ASP’s Reasons to be Thankful” speech to the supporters. Click here to read her message. Supporters from ASP National Office were Ms. Peng So (Vice-President), Ms. Tiffany Tan (Secretary), Ms. Evelyn Go (Treasurer), Trustees Ms. Carmel Almendrala, Ms. Fredeswina Javier and Ms. Noemi Viado and ASP Executive Director Ranil Sorongon. They were joined by PWAs Mike Almendrala (Special Olympian); Conrado Javier (BSBE-BM), Gio Koe, Gelo Go and the ASP Angels. To help disseminate information about autism, brochures and the ACAP Newsletter were distributed to interested participants. Messages from Foreign Supporters and Local Advocates Ms. Nanda Krairiksh, Director, Social Development Division, (UNESCAP) echoed the message of UN Sec. Gen. Ban Ki Moon, for the 2011 International Day for PWDs. Click here to read the message. Other messages were given by Mr. Akiie Ninomiya (APCD Executive Director), Mr. Takahiro Sasaki (Chief Representative of JICA, Philippines Office) and Dr. Soe Nyunt-U (WHO Representative in the Philippines). Engr. Emer Rojas, President, New Vois Association of the Philippines, talked the Declaration of Cooperation by the Thematic Sub-Group in Promoting Data Collection and Statistics on Disability. Other speeches were given by Ms. Annie S. Garcia, President, SM Supermalls, Hon. Corazon Juliano-Soliman (DSWD Sec. and Chairperson, NCDA), Engr. Ildefonso T. Patdu Jr. (ASec. DOTC) Hon. Severo Catura (USec. Presidential Committee on Human Rights), and Hon. Alicia R. Bala (USec. DSWD and OIC of NCDA) gave the closing remarks. 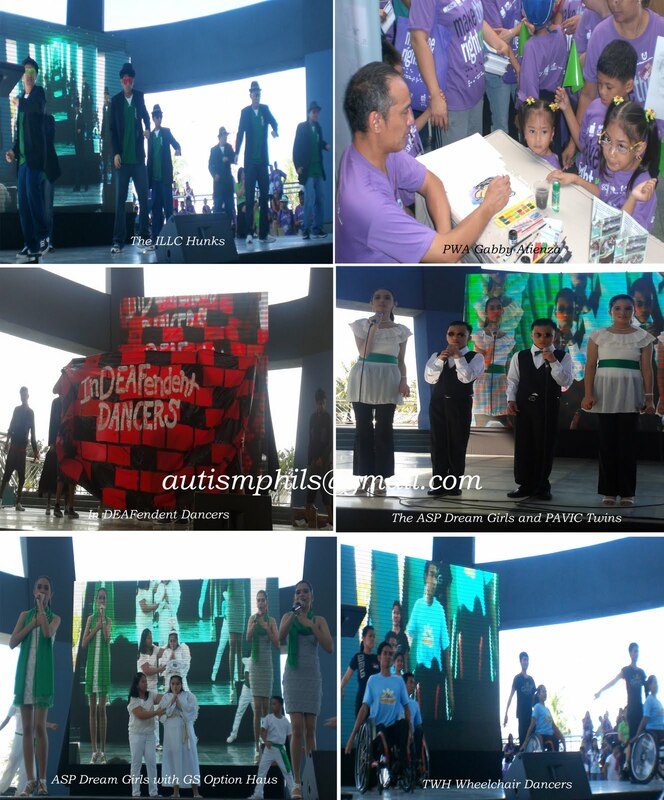 In between the speeches ASP Dream Girls and Students with Autism from GS Option House rendered their version of the song “Imagine” as popularized by John Lennon. PWA Gabby Atienza, gave free on-the-spot sketches for patrons and PWA Franco Cagayat distributed his car creations to PWD local and foreign supporters/advocates as tokens of appreciation. Independent Living Learning Centre (ILLC) Hunks, TWH Wheelchair Dancers from TahanangWalangHagdanan, San Antonio Elementary School SpEd Dancing Angels and The InDEAFendent Dancers kept the audiences entertained with their special abilities in singing and dancing. Photography with a Difference (PWD) also highlighted their photo collections with an exhibit, at the back of the Music Hall. There were volunteer photographers scattered around the mall to document the event. 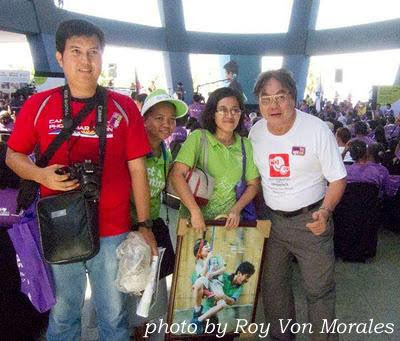 One of the photos of volunteer photographer Arthur Bellosillo III, came with a blow-up photo of Dad Romeo and PWA, Rolo Rodriguez of ASP UP CAMP Manila Chapter. His photo was selected by John Chua, Rehabilitation Volunteer Apolinario Mabini Awardee as one of the best “bonding moments” photo during the chapter’s photography activity. The photo is used as ASP’s Christmas Greeting Card for 2011. Emcees Mr. Abner Manlapaz, Life Haven Inc., Ms. Kismette Cepe, ASP Bacoor Chapter led the raffle prizes donated by SM Storyland and Gardenia. Special thanks to Working Committee and partner agencies of the Walk for Persons with Disabilities for making this event possible. Let’s continue to Make the Right Real! Special thanks to : DILG, DSWD, NCDA, UNESCAP, JICA, PIA, APCD, SM Supermalls, SM Cares, SM Mall of Asia, SM Program Disability Affairs, ASP, ASP Laguna, Cavite, UP Camp Manila, Muñoz, Commonwealth, Project 4, Malolos Bulacan, Mandaluyong, DOTC, DENR, CHR, Mr. Lauro Purcil Jr., Ms. Nelia de Jesus, Mr. Gabby Atienza, Franco Cagayat, Liliane Foundation, TahanangWalangHagdanan, PARM, National Vocational Rehabilitation Center Blind Masseurs, New Vois Association of the Philippines, AKAP, Mandaluyong Persons with Disabilities, Isabela PWD Federation, Hadicappables Association of Cagayan, ADHD Society of the Philippines, DSAPI, PAVIC, Clinica Manila, Gardenia, Lucky Circle Corporation, SM Foundation for the books and toys, SM Bicutan Hypermarket for the Goodies, SM Storyland and the Science Discovery Center for the free Rides, Delegation from Korea headed by Dr. Lee Dal-Yob, and Foreign Delegates from the 2nd Asia Pacific Community-Based Rehabilitation Congress represented by 64 Countries.